I’ve lost more than a few weekends to offerings from Armor Games, and Soda Dungeon (Free) certainly didn’t break that pattern. While it assuredly leans on the lighter side of the RPG scale, its combination of a compelling upgrade system and quick, yet not entirely brainless, battles make for a pretty good way to kill a few minutes or a few hours as needed. I’m also pleasantly surprised by its generosity. There are no catches in the game that you can’t buy your way out of with in-game currency. I’m not sure what the business plan is here, but I’m not a business reviewer, am I? The premise of Soda Dungeon has you playing a would-be adventurer who, in spite of their motivation, lacks the necessary skills to survive dungeon crawling. Luckily, the local tavern has at least a few fools who can be duped into running in and gathering treasure for you. All it takes is a little liquid courage. And sugar. Lots of sugar. After hiring your party, you’ll control them as they make their way through the 100 floors of the dungeon. In the likely event they can’t hack it and make a break for the nearest exit, you’ll get to keep the loot they drop. You can use gold to buy all kinds of things, and use equipment to beef up your next party. Somehow, you’ll always get that equipment back when a party runs away, so one way or another, you’re almost always moving forward. There’s just one problem. The local soda tavern is small and shoddy, and as a result only attracts the town soda junkies. 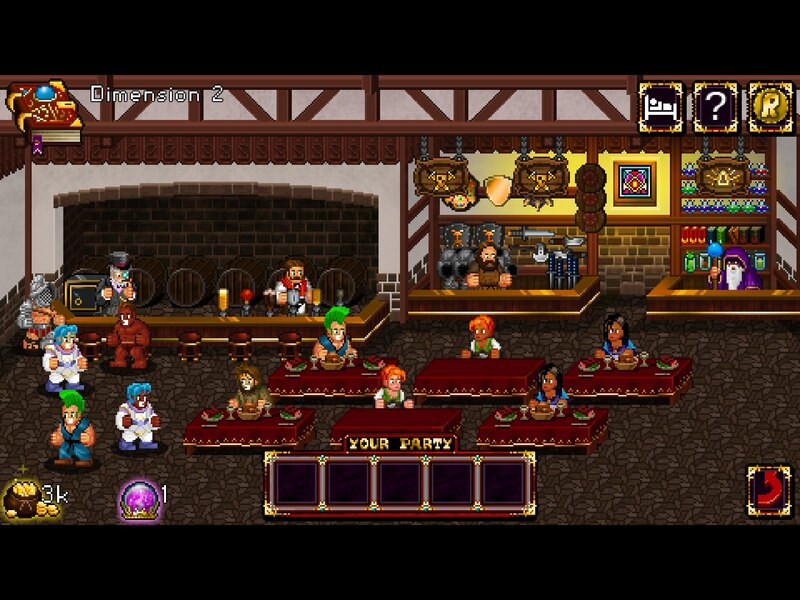 You’ll need to invest in sprucing up the tavern, and with every stool and table added, more customers will come. It takes more than that to pull in different types of heroes, however. Every job class has a favorite soda type, so you’ll have to spend the money to put a nice variety on the menu. You’ll need a good reputation, too, built by improving the many features of the tavern. You’ll soon unlock a shop where equipment can be bought and sold, a wizard who can teleport you to previously reached heights, and even a banker who will invest your earnings while you’re not playing, giving you some free cash whenever you decide to play again. Everything you can buy will help your next party in some way, improving their stats, abilities, and survivability. You’ll soon have a group strong enough to topple the boss of the 100th floor. Suffice it to say, the game doesn’t end at that point, with many more battles and plenty of neat perks awaiting you. When you’re starting off and having to form your parties from the cheapest heroes, the battles are pretty much brainless. The first few classes can’t do much more than hit things or use an item, which means you’ll mostly be tapping your way through. The only decisions you’ll have to make are concerning which enemies you’d like to strike with which character. There’s a little bit to consider there, like hitting enemies in the back where possible, or making sure a weak character finishes off enemies with little remaining HP, but the game can more or less operate on auto-pilot at this stage. And indeed, it can, if you want it to. Once you open up some classes with special skills or magic, things get a little more interesting. You’ll have to consider when to use your precious magic points, whether to heal or fight, and so on. The gear starts to involve more consideration, as well, as you’ll come across pieces that give you a benefit in some way while penalizing you in another. Still, even at its most difficult, victory is less a matter of careful tactical choices and more a function of your stats and gear. If you want to play Soda Dungeon mindlessly, it certainly won’t object with much fervor. The other thing it won’t mind is if you choose to pay some real money to move ahead quickly. Almost anything you can buy in the game with in-game currency can also be purchased with real money, to the tune of $0.99 each. That’s not so rare for a free-to-play game, though. What is rare is that the reverse is true. Anything you can buy with real money can also be bought with in-game currency, and that includes the ability to remove the ads that periodically appear. It’s not even a particularly wild amount of in-game currency, either, once you get rolling. Even after you’ve removed ads, you can still choose to watch an ad to get some extra gold if you’d like, however. The game’s economy balance isn’t particularly out of whack, either. On the upper end, a VIP menu opens up reasonably early on that gives you a lot of pie-in-the-sky things to spend your money on over the long haul. Most of the game’s progression is quite smooth, apart from the beginning where you might find yourself struggling on a set of floors while you get a decent team together. Even then, you’re getting new gear at a fairly healthy pace, so it doesn’t feel like you’re spinning your wheels. It helps that you can see that new gear on your party members as you equip it. Granted, Soda Dungeon goes for the well-worn pixel art style that a lot of games use, but it looks good for what it is and it’s at least consistent. The same goes for the music, which opts for a matching chiptune soundtrack. A couple of the pieces are pretty catchy, and none of it is annoying. The sound effects are probably a little more sparse than they need to be, though. There’s one particular effect used for lightning cracks and a few other things that comes up a little too frequently. 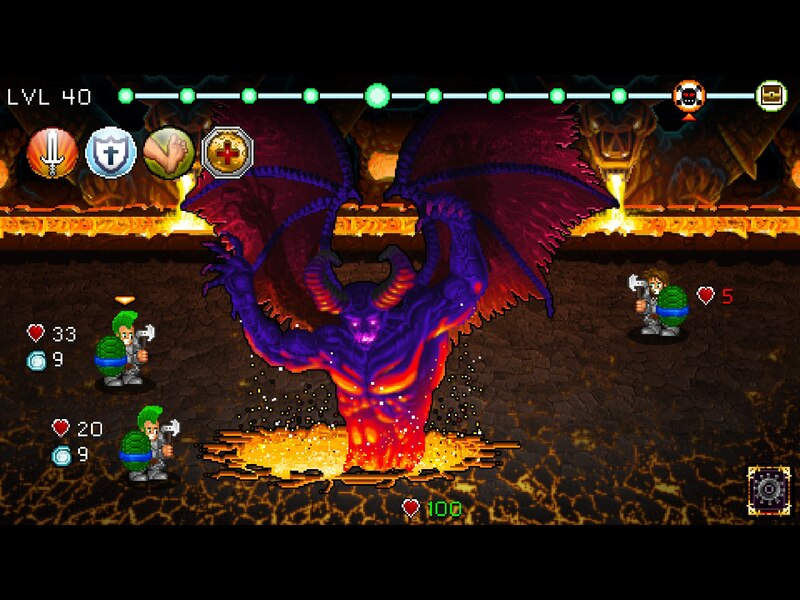 As for other bells and whistles, the game includes Game Center support for leaderboards and achievements, and some of the VIP options give you visual customization choices for your heroes. Like other games of this type, once you’ve exhausted Soda Dungeon, you probably won’t be inclined to come back to it anytime soon. The road to said exhaustion is packed with a lot of enjoyment, however, and it’s also longer than you might expect. With the game’s monetization model being what it is, the only real question is whether or not it’s worth your time. While the process of getting to the ending can get a bit repetitive after a while, I’d still give Soda Dungeon a pretty high recommendation. It manages to keep its light soda pop flavor while offering just enough bite to make you want to savor the taste. Give it a try, and you’ll find it can be just as hard to stop as real soda can be. Hey, at least this kind is calorie-free and relatively low in sugar.